Thinking of Bohol Pasalubong before returning home? The town of Jagna, Bohol makes sweets enclosed in coconut shells similar to binagol of Leyte (bagol means shell thus binagol). 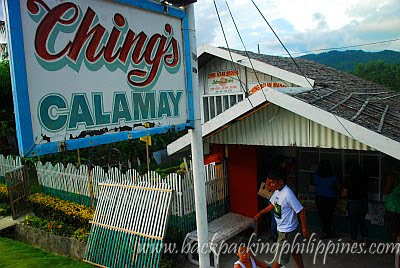 Tutubi saw some bohol kalamay peddled near the Port of Jagna but he didn't buy there on advise of his friend and instead led him to a home/factory along the highway, also in Jagna, called Ching's Calamay, one of the more famous makers of the Bohol pasalubong in coconut shells. The owner of the calamay factory allowed Tutubi to enter her home factory to take pictures of her sweet creations. Tutubi just missed the actual pouring of the hot syrupy calamay on the coconut shells but it's still quite warm when he got there. Newly-poured calamay syrup on coconut shells. 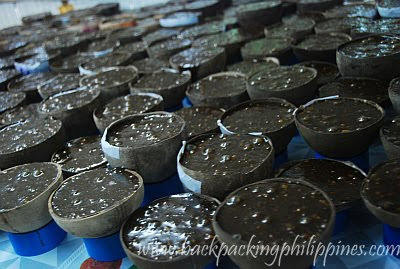 How to make Bohol Kalamay? It's just cooking ingredients (rice, coconut milk, sugar) in a large wok until syrupy consistency. Pour on half coconut shells to cool down and settle before stacking another half shell on top of another and seal with paper with adhesive. Price of bohol calamay is just PhP50.00 with or without peanuts and also in ube (purple yam) flavor.